Eye Care of Claremore is located in the Triumph Towne Centre at the corner of Florence & Patti Page. The facility provides space for multiple doctors, a spacious waiting room, and a large Optical retail showroom providing a wide selection of frames. Dr. Kuykendall, Dr. Cisper, and Dr. Fulps provide vision and medical eye care for the entire family. Dr. Eric Kuykendall see’s patients as young as 3 years old at Eye Care of Claremore. Dr. Eric Kuykendall has received additional training in pediatric vision care and behavioral optometry to assist children who struggle with learning at home and at school. 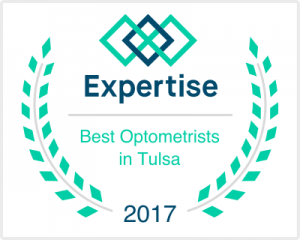 Young adults, baby boomers, and senior adults welcome the full-service eye care available at Eye Care of Claremore through our doctors and affiliates, nJoy (formerly TLC) and Eye Care Associates of South Tulsa and Owasso. Click the title below to read an amazing article about a young boy with Strabismus who, with the help of Vision Therapy, was finally able to see life in 3D. Our mission is to enhance the health and vision of people through compassionate, quality care by delivering the service and honor we would expect for our own family.